The old timers tell me they haven't seen quite a start to the season like this for years. The map shows just how much snow is around the island. 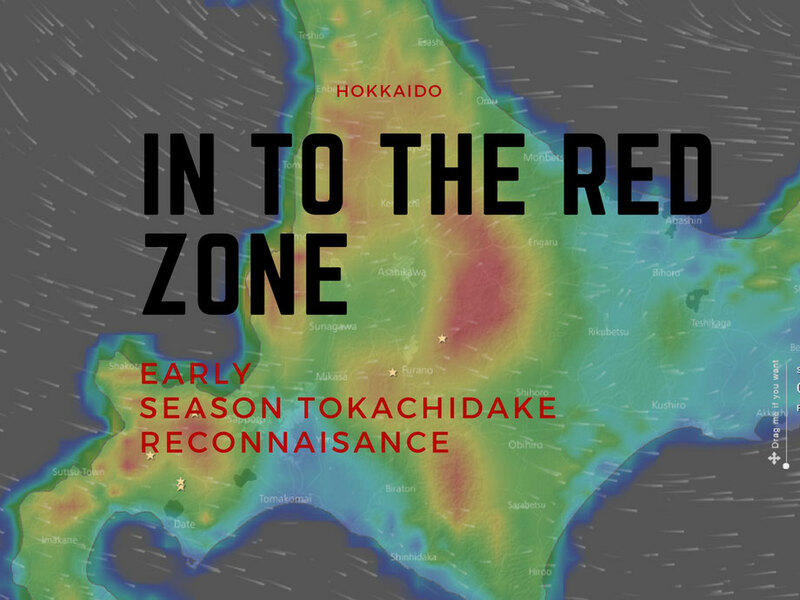 The red zones have between 2 to 3 meters. The big red mark In the centre of the island is the Daisetsuzan Range which is the largest national park in Japan. 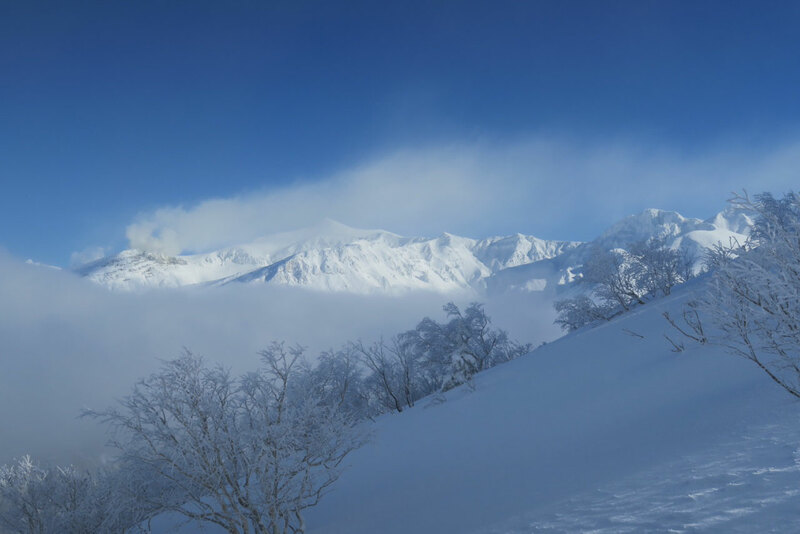 It is crowned at the northern end of the range by the live volcano of Asahidake, and in the south, by another live volcano called Tokachidake. Most of the start to this winter the mountains here have been cloaked by a thick veil of cloud and falling snow. It is probably earlier than normal than we would make a ski foray in to the area. Two meter bamboo grass below tree line and three meter haimatsu in the alpine usually limits the skiing to the gully features. To give you an idea of the height of the foliage and how Tokachidake looked just a month ago, check here. This time of year, typically there is the threat of snow snakes and turns have to be made with care, but the sheer amount of precipitation so far this season promised more. I was keen to see whether the snow depth map was right. I just needed the weather. 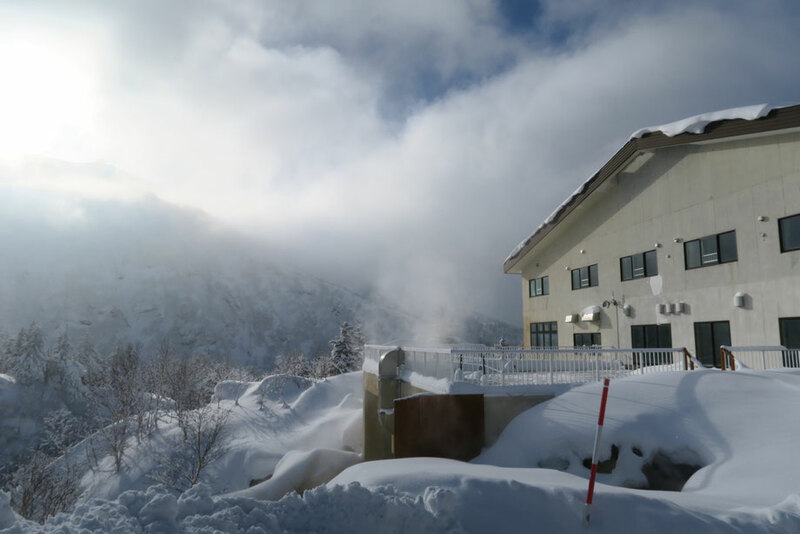 On Thursday morning December 14, Furano valley was clouded over, but a call up to one of the hot spring hotels in the park revealed that the cloud ceiling was at around 1,000 meters and the peaks were visible. I drove straight to the top of the road to Tokachidake Onsen which is at 1,350 meters. It certainly looked like a lot of snow. I then ascended Furanodake to 1,500 meters and found a 1.5 meter base. 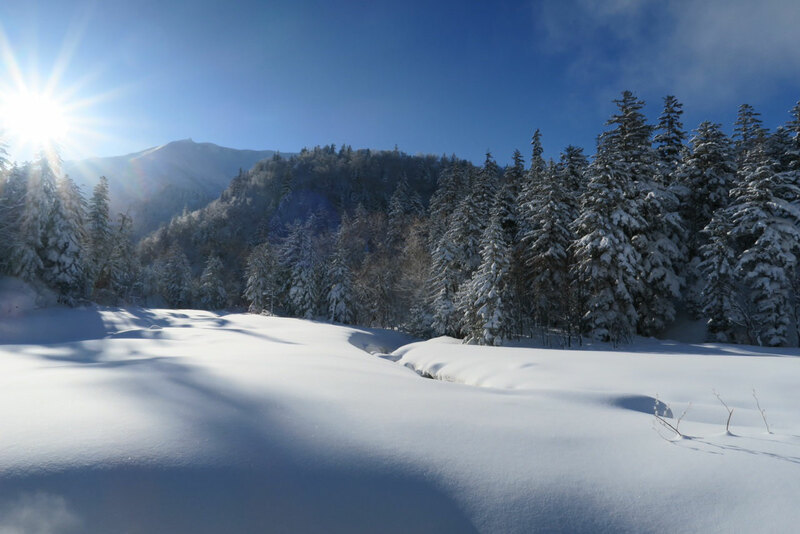 The bamboo grass was barely visible and enough of the haimatsu was buried to let the skis go. Afterwards I ascended to 1,500 meters elevation on Sandanyama and found between 1.5 -1.8 meters in the more exposed areas and over 3 meters in the gully features. Definitely in the red zone. It is looking like a promising season indeed.